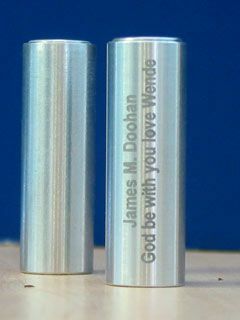 A module containing the cremated remains of Star Trek actor James Doohan, seen here with a message from his widow Wende, to launch into space on the Legacy of Flight mission by Houston-based Celestis. The ashesof Star Trek's Scotty and one of NASA's first astronauts are once morebound for the final frontier, this time aboard a privately-built rocket to launchfrom New Mexico this month. Portions ofthe crematedremains of actor James Doohan, the plucky engineer of television's StarshipEnterprise, and Mercury astronaut Gordon Cooper are set for an April 28 launchaboard a SpaceLoftXL rocket built by the private firm UP Aerospace. The spaceshot - dubbed SL-2 - will lift offfrom Spaceport America, a state-funded launch site near Upham, New Mexico andabout 45 miles (72 kilometers) north of the city of Las Cruces. The remainsof Doohan, Cooper and more than 200 people from over 10 different countries willride the UP Aerospace rocket as part of the Legacy of Flight memorial, a spaceflightarranged for the Houston-based firm Celestis, Inc. A public memorial honoringthose whose remains will launch spaceward is set for April 27 at the New MexicoSpace History Museum in Alamagordo. "Spaceremains the domain of the few, the dream of the many," Celestis CEO CharlesChafer said in a statement. "With Celestis, the dream of spaceflight and thedesire to take part in the opening of the space frontier can be realized - andis available to everyone." The plannedApril 28 liftoff will mark the second SpaceLoftXL flight for UP Aerospace, which first launched the 20-foot (six-meter) boosteron Sept. 25 though it failed toreach space. Since then, a series of modifications and design changes havebeen instituted to improve the rocket, UP Aerospace officials have said. The suborbitalrocket is designed to haul 110-pound (50-kilogram) payloads to altitudes ofup to 140 miles (225 kilometers). Celestisofficials said that, in addition to the cremated remains, the launch willfeature the firm's Earth Rise service to loft capsules and modules designed toparachute back to Earth for recovery and presentation to family members. Inspirationalmessages hailing Cooper and Doohan will also be launched during the flightalongside messages from students in Japan and the U.S., star dedications and amusic album composed and performed for Celestis by the Russian band Cyclotimia,the firm - a subsidiary of Houston's Space Services, Inc. - added. Celestiswill donate portions of the flight's proceeds to the Frank Redd ScholarshipFund for aerospace students, New Mexico's Zia Pueblo Scholarship fund and Arizona'sCowboys for Kids, one of Doohan's favorite charities. UPAerospace officials said the spaceflight will also carry a series of commercialpayloads, as well as experiments from U.S. universities, high schools and elementaryschools. "Ourlong-term commitments with Spaceport America and Celestis are essentialelements that are enabling huge growth of this new emerging commercializationof space industry," Jerry Larson, president of UP Aerospace, said in astatement.